So here’s my conundrum: Will my pessimism be proven correct, or should I jump on board the rally bandwagon? Clearly, all is not well with the markets. We have had lots of rallies over the past two years, but each and every rally failed to take out the previous high. The failure after May 8 to surpass the previous 935 level is very bad news. Each successive “lower high” may only be 4 or 5% lower than the previous high (with the exception of the 968 post “crash” high on October 31, which was 32% lower than the previous high), but lower is lower. On average each successive low after a high is 21% lower, and it takes 77 days to get there. Some are shorter. The drop from the peak on October 31, 2008 at 968 to the valley on November 21, 2008 at 800 was only a 17% drop, and it only took 21 days. 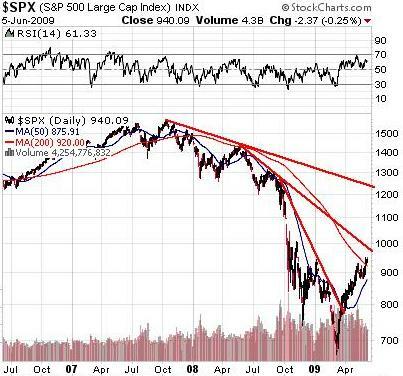 The 39% drop ending on October 24, 2008 took 161 days. If you want to extrapolate the average, from the May 8, 2009 high of 929 we are looking at a 21% drop over 77 days, so we will land at 734 on the S&P 500 on July 24, 2009. Well, guess what. The S&P 500 is now at 940, it’s highest level all year. Year to date the S&P is actually up 4%. That would appear to be something more than a a Sucker’s Rally. It would appear that Sell in May and Go Away was not the correct strategy. Maybe happy days are here again. Part of the optimism may be due to President Obama’s impressive performance in Egypt on Thursday. I found myself on my Elliptical machine in my workout room at 6:00 am on Thursday morning, so when the President’s speech aired at 6:10 am I had 35 minutes to watch most of the speech. It was impressive. He said all the right things. Everybody with a brain agrees that it’s a good idea to talk with people who share different points of view, because through talking we may find common ground. And, of course, talking is generally less deadly than starting a war. Markets like peace and prosperity. So perhaps I should just go with the flow and start buying. But as I did my early morning workout I started to think: will Obama’s speech change anything? President Obama wants to change things, but will the American’s relationship with the Muslim world really change? Will the Muslim world embrace democracy? They do in Turkey and Indonesia, but it most other countries, not so much. Egypt’s President Hosni Mubarak is an iron-fisted ruler, not a warm and cuddly advocate of democracy. Women’s rights? In Saudi Arabia women are not allowed to drive, or get a fair divorce, or avoid a family imposed marriage. Change does not appear evident in this area. Religious tolerance? Nope. Obama mentioned that there are 1,200 mosques in every state in the union. In the Arab world the Shiites and Sunnis kill each other, so forget about seeing Synagogues or other places of religious worship. The right of Israel to exist? Nope, that’s against policy in many countries as well. As regular readers know, I am a Canadian, so I have no voting interest in what happens in the USA. I hope Obama is successful. I hope he brings peace to the world. I admire his guts for taking on Middle East issues this early in his presidency; most of his predecessors wait until their final year in office to get involved, in the hopes of winning the Nobel Peace Prize. Spending some political capital on this now takes guts, and I admire him for it. Unfortunately, the task is massive, and perhaps impossible. He is a great messenger, and he has a great message. I just don’t think a great speech will repair hatred that goes back a 1,000 years. And therefore while I’m happy the market’s like it, I still don’t believe it’s real. Yes, the market is up. Yes, the market is trading above it’s 200 day moving average, for the first time in a long time, and that’s good news. A close above 1,000 will be another decisive break of a down trend line. A close above 1,200 would be a break of the final significant down trend. If that happens, we may be out of the woods. But look around you. Unemployment is still very high, and increasing, regardless of the positive spin the news media puts on it. Yes, house sales are up this month, but May and June are the busiest months of the year, so comparing them to the winter is a silly comparison. And let’s not forget that GM went bankrupt this week, and Chrysler already was, so the world is not perfect yet. So I solve the conundrum by sticking to my guns, and staying in cash, on the sidelines. I believe the Big Boys have created this rally to unload stock. Insider selling remains very high. The banks are issuing stock like crazy to pay off their TARP loans, and obviously if they thought that the market would be higher in six months they would wait six months to issue stock at higher prices. They are selling now because they know we are approaching a near term top. When the market falls, gold and everything else falls, in the short term, so on Thursday morning I covered all of my remaining gold and silver stock holdings. (I sold June at the money call options against all of the optionable gold and silver stocks I own. I took in a premium for doing so. If my shares are at the same level or lower by the close on June 19, I keep the premium. If shares advance between now and then I lose my stock, but that’s a risk I’m willing to take for the insurance). I apologize for the lack of happy talk, but I call it as I see it, so I will remain in cash for a while longer yet, until the conundrum resolves itself. I’m not going to let a 4% rally on the year convince me that all is well. Thanks for reading, as always feel free to post your thoughts on the Buy High Sell Higher Forum, and see you next week.